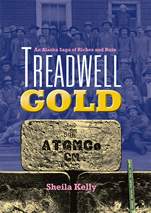 Treadwell Gold, An Alaska Saga of Riches and Ruin combines Alaska history, hard rock gold mining history and a frontier memoir. 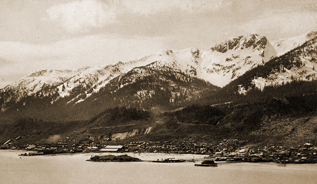 A hundred years ago, the world famous Treadwell Gold Mines on Douglas Island across Gastineau Channel from Juneau, Alaska, were the featured stop for steamship cruises up the Inside Passage. The book gives first person accounts from the sons and daughters of the hoist operator, mine superintendents, and the machinist who was the author’s grandfather, plus stories of the miners who came from around the world and the Tlingit who lived there for centuries. Turning rock into gold was dangerous work. Mine explosions, fires, strikes and labor unrest figured into the everyday lives of the townspeople. The Alaska Treadwell Gold Mining Company’s aggressive mining practices paid high dividends to stockholders until April 22, 1917. A spring tide worked its way down into the mined-out caverns triggering a spectacular cave-in and brought an abrupt end to the glory days of Treadwell, Alaska. Unlike the Klondike Gold Rush of 1897, when solitary placer miners created a flash-in-the-pan myth, the Treadwell mines created another kind of gold rush. A 19th Century corporation used capital, technology and labor to achieve riches and world prominence mining a mammoth lode that took eight and a half tons of ore to produce one ounce of gold. Perched on top of the mines, the company town housed two thousand workers and their families. The gritty utilitarian settlement boasted an indoor swimming pool, finely-appointed Turkish baths, a clubhouse with movies, dances, billiards, and a library with two thousand books. To see more of the mine and town, go to the PhotoTour page. The book includes a hundred photographs from the collections of Case & Draper, Winter & Pond, and E.A. Hegg, showing the workings of Treadwell. Taken with the personal pictures from the albums of Treadwell families, the stories and the photos capture the industrial romance that made the Treadwell mines famous and the daily lives that made Treadwell real.